If you're like me, then your Christmas list isn't filled with that expensive sweater or new appliance for your kitchen but, instead, it's filled with DVDs, Blu-rays and other TV-centric items that you have yet to buy for yourself. So, like a good TV Fanatic, I thought I'd give my fellow Fanatics a hand and suggest some of the best items out there on the market to keep your TV love alive. Breaking Bad Complete Series: It's still hard for me to believe that the journey of Walter White ended this summer as Breaking Bad concluded its amazing six seasons. Thankfully, the entire series is available on DVD and Blu-ray from Sony Pictures Television. 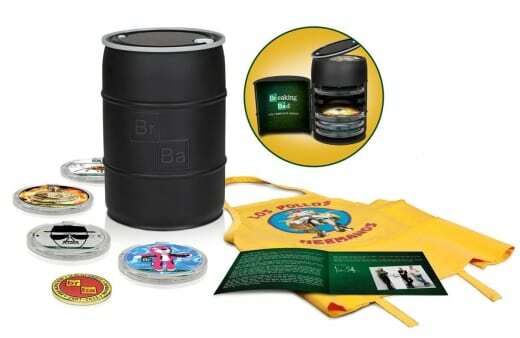 Not only do you get 16 discs in the set but those include 55 hours of special features from all seasons, an all-new 2-hour documentary, 16-page booklet with letter from creator Vince Gilligan, a commemorative challenge coin designed by Gilligan, a Pollos Hermanos apron and a collectible replica money barrel. Bravo, Breaking Bad! Dexter Complete Series & Final Season: Whether you want to relive the final season of the Showtime series or want the entire series, both are available now and would make a killer gift! (Sorry, pun intended). Follow either the last chapter of serial killer with a purpose Dexter Morgan (Michael C. Hall) as he tries to live a normal life while also keeping his serial killer mission a secret. Some seasons are better than others (the final season left much to be desired in my opinion) but it's still a ride like none other. The good news? The Complete Series comes with a recreation of the actual blood slide box used by Dexter. There's also plenty of extras for each season as well as a never-before-seen feature with Michael C Hall and psychologist Kevin Dutton as they examine the world of psychopaths. Good stuff! Doctor Who: Past or present, there's nothing like Doctor Who and there have been a plethora of great offerings lately for any TARTIS lover. Delving into the past, new releases of The Tenth Planet, Terror of the Zygons and The Doctors Revisted (Series 5-8). You can also still enjoy Matt Smith as the latest Doctor (before he vacates the role) with the seventh series DVD,w hich also includes the 2011 and 2012 Christmas special. It's a Doctor Who smorgasbord! Fill that stocking! Mad Men Season 6: The 60s are definitely not proving to be easy for the men and women of the AMC hit series. Don Draper continues to be one of the most interesting TV characters of all time but the rest of the ensemble are on just as compelling of a ride during the show's 6th season which had more drama and hard knocks than happy, good times. Is Mad Men a reflection of life? Who cares? Creator Matthew Weiner weaves a world that you may love or hate at times, but, trust me, you won't be able to look away. Duck Dynasty: Seasons 1-3: We've already accepted that this unlikely reality series built around the Robertson clan has captured our hearts and our funny bone and now you can relive the first three seasons, over 30 minutes of never-before-seen footage from the series and, also included in this collection, a super cool bandana! The stories range from family cooking, fishing or football competition, a blind leap into wine making and run-ins with critters of all kinds. All good stuff! Beverly Hills, 90210 Complete Series: Still missing the adventures of Brenda, Dylan, Brandon, Kelly, Steve, Donna, David, Andrea and the rest of the original 90210 gang? Check out this new 10-season collection of the Fox series that ran from 1990-2000. All the romances, breakups, social issues, drama and, later in the series, babies and marriages! Arrow: Volume 1 Comic Book: If you love the series, the first volume of the comic book, written by series creators Marc Guggenheim and Andrew Kreisberg (with illustrations by Mike Grell), captures the same exciting mystery, intrigue and action of the hit CW series starring Stephen Amell. According to the back cover, "Dive deeper into the CW series with more than a dozen never before seen vignettes from the world of Arrow." Available anywhere comic books are sold. World Series 2013: If you have a baseball fan on your list to buy for, two amazing collections from this fall's epic World Series where the Boston Red Sox took away the pennant. In the first release, Official 2013 World Series Film, relive the entire series from start to finish. Then, dive into the Boston Red Sox 2013 World Series Collector’s Edition, which includes seven full game broadcasts as well as a full hour of special features. It's winter but it's always time for baseball, right? Everyone have a Happy Holiday and the Best New Year possible!